Caucasus Youth Nexus is pleased to announce a vacancy for the position of Project Assistant. 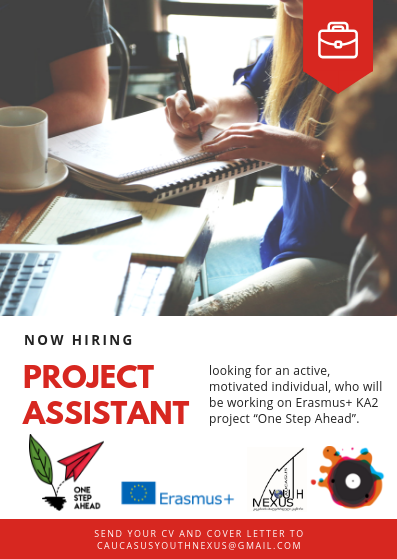 We are looking for an active, motivated individual, who will be involved in Erasmus+ KA2 project “One Step Ahead”. “One Step Ahead” is a year-long project about social entrepreneurship, which is implemented with the support of the European Commission. The project coordinating organization is “Caucasus Youth Nexus” NGO (Georgia). Project partners are organizations “AsociatiaObsteasca INVENTO” (Moldova); “FUNDACJA AUTOKREACJA” (Poland); “Ung Kraft/Youth Power” (Sweden). – BA Graduate or final-year student specializing in business or economy. Work schedule – Part-time, 20 hours a week. Salary: – According to the activities implemented within the project.